Little, Brown and Company, 9780316343763, 336pp. - Medical interventions have become the third leading cause of death in America. - An estimated 10 percent of Americans are implanted with medical devices -- like pacemakers, artificial hips, cardiac stents, etc. - The overwhelming majority of high-risk implanted devices have never undergone a single clinical trial. In THE DANGER WITHIN US, award-winning journalist Jeanne Lenzer brings these horrifying statistics to life through the story of one working class man who, after his "cure" nearly kills him, ends up in a battle for justice against the medical establishment. 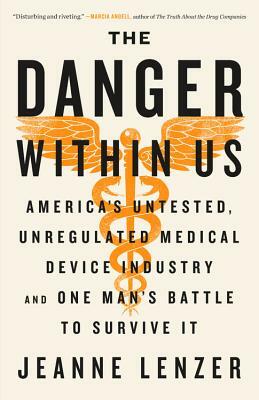 His crusade leads Lenzer on a journey through the dark underbelly of the medical device industry, a fascinating and disturbing world that hasn't been written about before. What Lenzer exposes will shock readers: rampant corruption, elaborate cover-ups, shameless profiteering, and astonishing lack of oversight, all of which leads to dangerous devices (from artificial hips to pacemakers) going to market and into our bodies. Jeanne Lenzer is an award-winning medical investigative journalist and former Knight Science Journalism fellow. She is a longtime contributor to the The BMJ (formerly, the British Medical Journal), and her articles, reviews and commentary have appeared in the New York Times Magazine, Atlantic, The New Republic, Discover, Slate, Mother Jones and many other outlets. emergency room physician associate to become an investigative medical journalist.